Never Marry A Warlock for free during the special promo for Read An Ebook Week on Smashwords. This is also just in time to celebrate Read Across America. Bring that Kindle or Nook to work to show off the newest ebooks. Many books are to be found to fill your Kindle to keep you busy for months. Thanks for joining the Marilyn Vix Website: marilynvix.com. For the inside info on the next novelette, Never Fall For A Warlock (Beware of Warlocks #2), stayed tuned. More information will be available in the next few weeks. 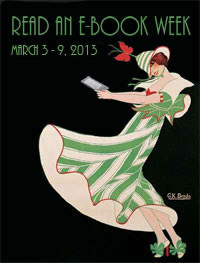 Happy Ebook Week!